The last year for the University of Iowa Wesley Foundation has been one of incredible growth for me within this community. I could not have asked for a better group of people to get to know over my senior year of college. Being one of the student leaders at Wesley has helped me develop a stronger spiritual core and gain a better understanding of how to be in tune to others and their needs. It was an incredible blessing to be in community with a group of people who were dedicated to being true with each other and having conversation, even when it was not easy. These are people that now know me at a deeper level than just about anyone else. One thing that truly made the experience was that it allowed me to branch out beyond just the university campus. I have made connections with those all over the state of Iowa who are just as dedicated to seek the social justice and welcoming I could not put a name to until this year. I don't know where I would be without Wesley. It has been an integral part in making me believe that I am ready for the world and will be able to make community wherever the next step may be. "The world is our parish." 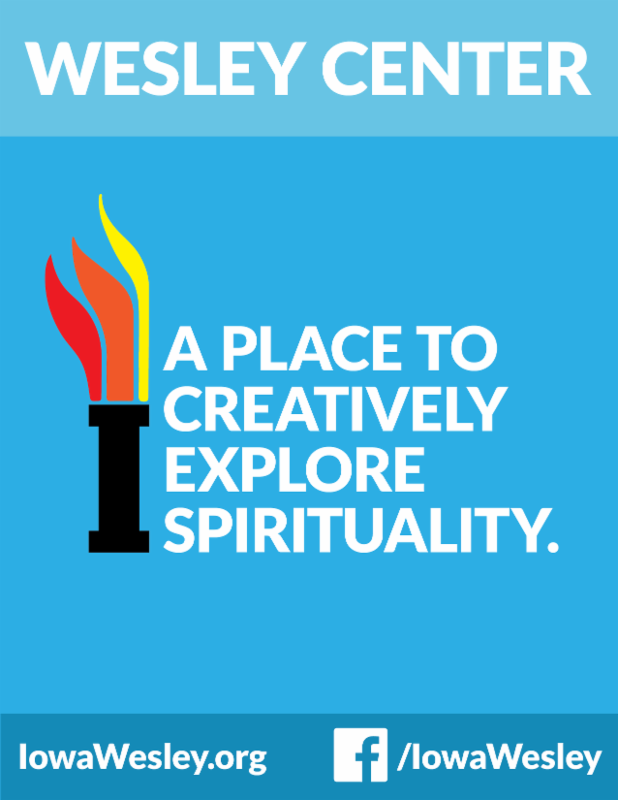 Students often testify to how important it is to have designated space for campus ministry, a Wesley Center they know will be open and hospitable, offering freshly brewed coffee and a safe space for gathering, praying, laughing, crying, and growing in faith and faithful practice. Our weekly Brown Bag Bible Study has become one weekly opportunity students, faculty/staff, and members of the wider community have to gather at Wesley, share in scripture, and reflect on how it is with our souls. And yet, so much of campus ministry happens outside our doors. Much of it happens one-on-one, over coffee, in local coffeeshops or on park benches. Campus ministry is pastoral counseling, vocational discernment, faith formation, leadership development, spiritual direction. As a campus minister, I regularly meet with countless students who are otherwise "unchurched." We are not a local church. And yet, we are a faith community. For our Easter celebration, we gathered in the pre-dawn darkness. We walked in silence through a local cemetery, stopping to read Psalm 119 by moonlight. We hiked through Hickory Hill Park, and broke our silence by reading the four gospel accounts of the resurrection. We celebrated communion with grape juice from a mason jar and pita bread pulled from a backpack. We read poetry and celebrated God's power to bring us back from death, and breathe new life into our daily discipleship. "The world is our parish." Thanks be. LOVING KINDNESS: When students first arrive for Swing Dancing at Wesley, they are often visibly nervous and tentative. Will they feel welcome? Will they feel foolish? Will they have to dance alone? By the end of the evening, they are all dancing together and laughing together. They have learned they are welcome here. No one dances alone, unless they want to. And feeling foolish isn't so bad, when you're surrounded by kind and loving community. SEEKING JUSTICE: Pastor Max Villatoro was detained this month, taken from his home in Iowa City by ICE agents while his wife was in the shower and his four children were asleep. His deep love for Jesus has fueled his ministry, marked by over twenty years of faithful service, ministries of compassion, and outreach to those struggling to survive. If he is deported to Honduras, his children will be left without their father, his wife will be left without her beloved, and a community will be left without their pastor. 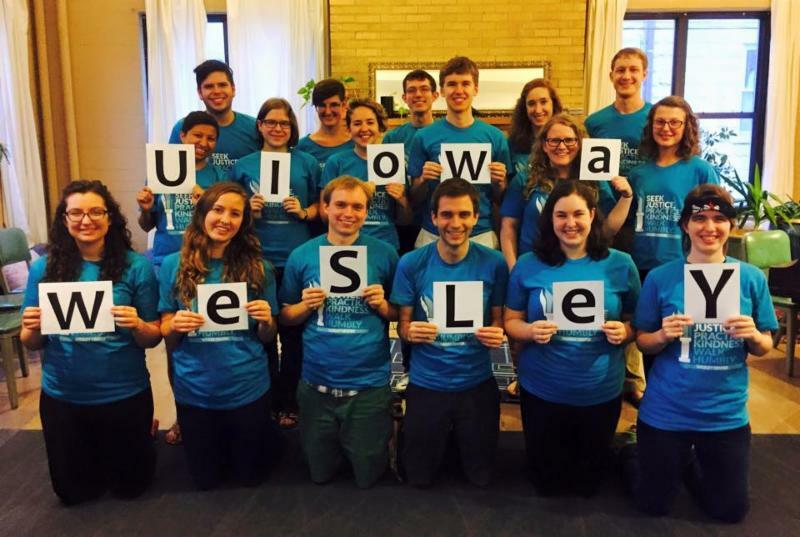 The University of Iowa Wesley Foundation spent an evening in conversation with young adults from Nicaragua. The Nicaraguans are a part of the Youth Network Against Violence in San Francisco Libre, Nicaragua. The Youth Network Against Violence began as a part of United Methodist missionary Nan McCurdy, who works for the Women and Community Association in San Francisco Libre. The six young adults from the Youth Network Against Violence spoke about their mission to end the machismo culture, to support gender equality and to end domestic violence. They spoke with passion about their stories and their mission. They engaged the students at the Wesley Foundation asking question about gender roles and sexuality in Iowa City. They wanted to know more about the Wesley ministry and what we were doing to change the world. The exchange went back and forth for over two-hours as the distance of culture and language became bridged, and the young adults from the United States and Nicaragua began to share a common dream for the world. For decades UI Wesley pioneered in developing student faith leaders through what was called Peer Ministry. Peer Ministers practiced and shared their faith, built up community, and led small groups and events. Their leadership connected to other students as peers. This year Wesley tweaked the Peer Ministry program to create a five person Campus Ministry Intern Team. These Student Interns still practice and develop spiritual leadership, but they also work in specific areas of campus ministry including: social media and communications, graphic arts, teaching and religious programs. Their campus ministry internship develops not only their leadership, but specific skills for future work. Candidates for Wesley internships apply and interview. Interns work 10 hours per week and receive stipends. They participate in individual mentoring with a campus minister and work collaboratively on the team. Everyone does outreach to new students for Christian community and helps draw out the leadership of other students. In the midst of student realities of financing their education and career preparation, the Wesley Student Internship Program keeps the heart of developing spiritual leaders. Education makes the difference for creating a hope-filled future. Students in the Wesley community know that personally, but they also know it because of a friend named Erick in El Salvador. Over the past 9 years the UI Wesley Foundation has taken student trips to El Salvador to learn through experience and build friendships. In 2005 UI students met Erick Mendez and began a friendship bridging "generations" of students. frail health. Because of the National Police's violent history Erick did not want to join, but felt he had no choice. The Wesley students made a commitment to partner with Erick for high school & college scholarships to give him better choices for his future. For nine years students fundraised with Lenten coin banks, Salvadoran benefit meals, and direct asks of family and friends to help. During that time they raised about twenty thousand dollars for Erick's education. Erick worked hard and did well as a student. A few years ago he married. He and his wife, Esmeralda, have a three year old son, Cesar. Next week Erick defends his thesis, the last step before graduation from the University in San Miguel. Erick plans to work as a counselor. It's been a long journey for students in Iowa and a young man orphaned and without means in El Salvador. But what a blessing for everyone involved to see what education and hope can do! Experimenting with new places, Campus Minister Paul M. Shultz will hold a weekly Bible study at a local pub and restaurant in Iowa City called "the Sanctuary." 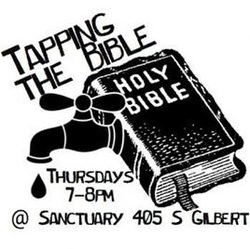 Join us on Thursday nights as we meet to wrestle with Christian Scripture to perhaps challenge it or be challenged by it. Open conversation with all thoughts and questions considered.